Fitting of the slide bars continues as does work on various components of the pony trucks. 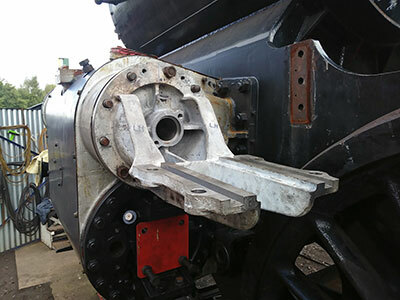 The rear steam chest covers have been delivered from The Boro’ Foundry and a trial fitting has taken place. 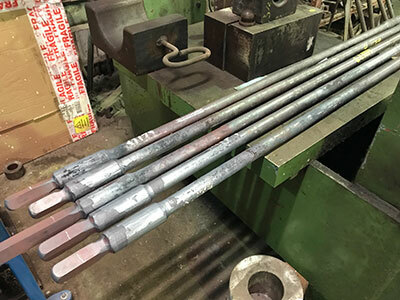 Some handbrake components have been delivered from Coded Welding Wolverhampton Ltd.
Stephenson Engineering at Atherton are busy manufacturing the expansion links and also transverse stays for the firebox. 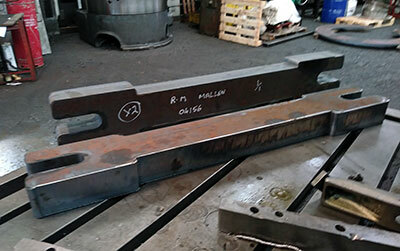 They have recently supplied us with the stiffening plates for the firebox. These are additional plates that are attached to the water side of the steel outer firebox sides and backplate. 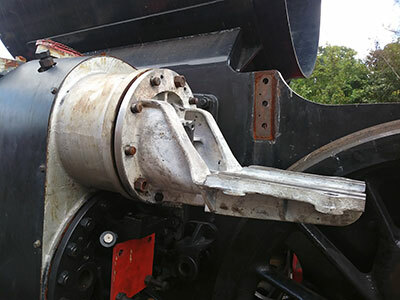 Some of the team visited Classic Motor Cars Ltd. Bridgnorth recently to talk to their senior body work technician about the possibility of them making the more complex shapes of the firebox cladding in the knowledge that they have done this work for another SVR based locomotive. Look out in the forthcoming issue of Steam Railway (due to hit the shops on 12th October) for a piece on 82045 in the magazine's regular "Inside Track" feature. The same issue will also carry a half-page advertisement and an appeal leaflet insert, so fingers crossed for a good response. It's always difficult to quantify what you are going to get back for your investment, but up to now our relationship with Steam Railway has been a beneficial one - hopefully for both sides - and we are grateful for the generally good coverage the magazine continues to give us. I even managed to sneak a bit of Latin into the ad, so if anyone would like to know what it means when you've seen it, let me know (it isn't rude, by the way!). The coming month sees a melancholy anniversary, being exactly fifty years since the last examples of the 82XXX class were broken up: two months after the end of BR steam and a tantalising opportunity to save one (or more) of them missed. Many of you will already have seen the accompanying photograph of 82031 about to meet its end at the all-too-eager hands of Cashmore's in Newport, South Wales, as this featured on one of our appeal leaflets a couple of years ago. 82031, along with 82003 and 82034, were not the last of the class in service (that dubious honour went to Nine Elms's 82019 and 82029 in July 1967) but had survived in store at Patricroft shed in Eccles, near Manchester, long after withdrawal. What makes it worse is that well-known SVR and ELR stalwart Frank Cronin had tried to buy one of them in 1966 - I think it was 82034 and it had done very little mileage since its last overhaul - but, as an impoverished student, was deterred by the price quoted (about £1500) and settled for Jinty 47383 instead. 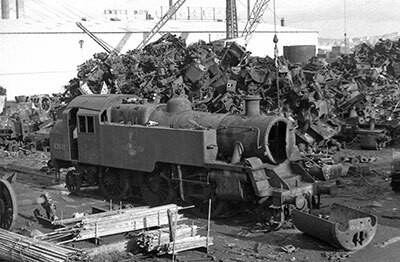 The point of this sad little story is to underline the fact that we are determined the photograph should not remain the last-known image of this largely unsung little class of perfectly good engines. It is not boasting to say that 82045 is - and is widely acknowledged to be - one of the top handful of new built projects, and everyone concerned is looking forward eagerly to the day when it brings the 82XXX class back into the land of the living. On the occasion of the special train we ran in memory of Paul Anderson last October, we also took the opportunity to launch the Future Fund - possibly a little prematurely, but we wanted to do everything within our power to safeguard the future of the engine. For this reason, I will be writing a piece in the March Newsletter, in which I will ask our supporters if they will consider maintaining a monthly contribution to the Future Fund once 82045 enters service: in an increasingly hard world, we are going to have to be as independent as possible for as long as possible, and I hope to be able to maintain a regular income composed of monthly standing order revenue plus that from steaming and, after the first operating season - when the engine will run exclusively on the SVR - hire-out fees. It looks as if I will be in this until my dotage, if not my wooden box, and I hope enough people feel the same. I still want to build Sir William A. Stanier, F.R.S., though, so there will be lots to do when I retire from teaching next year - suppose it's better than watching daytime television! The 2019 AGM will take place on Saturday 6th April at 2.00 p.m. in the usual venue, the upstairs Lecture Theatre at Kidderminster Railway Museum. 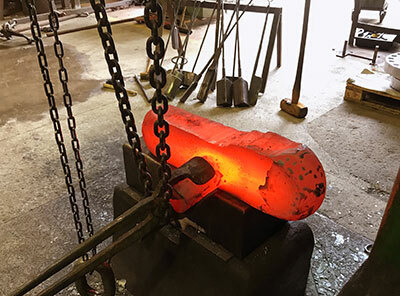 Expansion link forging. Photo: Robert Stephenson. Firebox transverse stay forgings. Photo: Robert Stephenson. Pony truck check spring beams. Photo: Peter Line. Rear steam chest cover. Photos: Peter Line. 82031 about to meet its end at the all-too-eager hands of Cashmore's in Newport, South Wales.